More specifically the Centaur KAAAHHHNNNS! 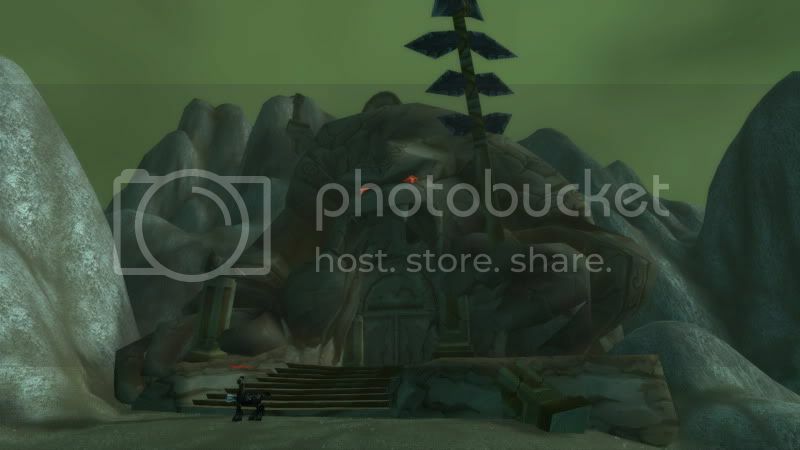 While wandering around trying to finish up my Lunar Festival achievements (If you are wondering – No, I did not succeed. One Omen kill and most of the Northrend Elders got missed by the deadline), I had to make my way back into Maraudon. While not exactly my favorite dungeon, I’ve made my way through it enough to no longer get lost. But despite all the times I’ve paid the place a visit I never really noticed the massive sculpture looming over the door. It’s a very strange-looking structure, and doesn’t exactly resemble anything you’ll find inside. But it would have to be something important for the centaur to build it over the entrance to their holiest sanctuary. Since it doesn’t look anything like a Keeper of the Grove nor Theradras, I assumed it was supposed to resemble a great ancestor of the Centaur. Maybe the first centaur? Or maybe a hidden clue as to the real origin of the centaur race! This talk of Zaetar and Princess Theradras is nice, but it’s about as believable as the Moon being the eye of the Earthmother. After all, why would any being ever and I do mean EVER want to have relations with Theradras? Have you seen that behemoth? I mean, granted, I’ve known many people who have a thing for big girls. But how about a very big girl with three faces and four arms? And not one of those faces are in the least bit attractive. More like an Ogre after some beatings with a shovel. Zaetar had to have had way too much to drink or the whole things a hoax. And don’t even try to tell me that a Star Wars character has no place coming to Azeroth. 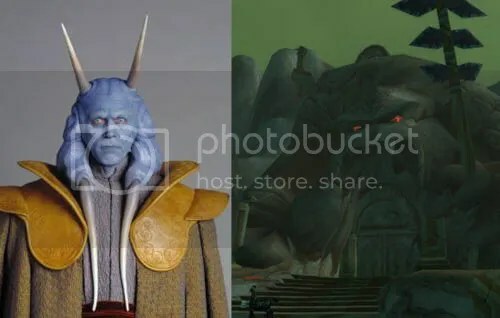 Because until you can prove that the Draenei couldn’t have shown up in a space ship from another planet, you cannot deny the possibility of WoW taking place in a galaxy far far away. But if that’s not your liking, how about this: The original Kahn of the centaurs was… King Koopa! It probably is one of the goofiest sculptures I’ve seen. I mean, aside from extremely confusing and pointless ones. The tree animal sculptures in Darnassus look quite nice and the massive statues that northern Kalimdor are also quite nice (if a little broken), but this thing is completely absurd looking. If it wasn’t for the hands, I would have thought it was a pharaoh hat but it’s not like that would clarified what it’s supposed to be anymore. It could simply be something that is inside Maraudon but Centaur are just terrible sculptors. Maybe its Rotgrip! Whatever it is, it does make me giggle when I see it. After all, the last thing you’d expect to see in a place as depressing as Desolace is something resembling a giant cartoon character. Posted on March 12, 2010, in Eastern Kingdom, Oddities. Bookmark the permalink. Leave a comment.